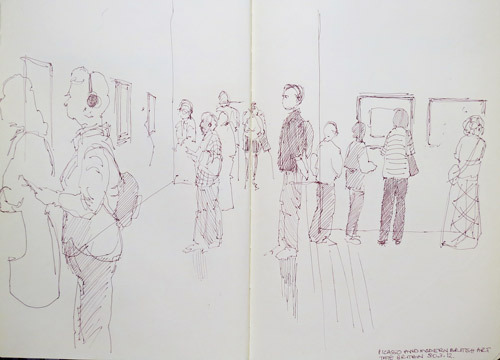 Yesterday I visited the Geffreye Museum with the Drawing London Group. This is a museum of the home and garden between 1600 and the present day. It's situated in Hoxton - inbetween Kingsland Road and the new Hoxton London Overground Station (opened July 2010). 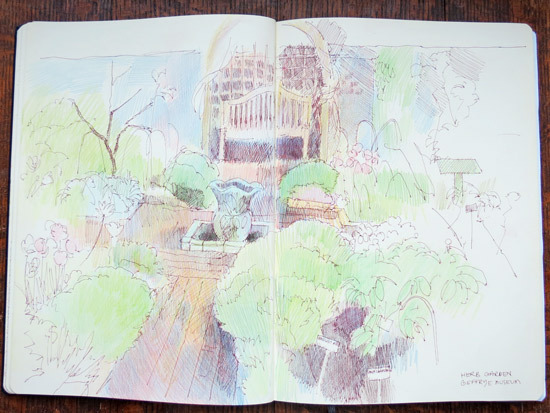 The weather wasn't brilliant (constant showers) but the view of the period gardens at the rear of the museum from the cafe was - so I stayed inside during the morning and was able to sit comfortably, spead by pencils on a table and drink cups of tea! Bliss! 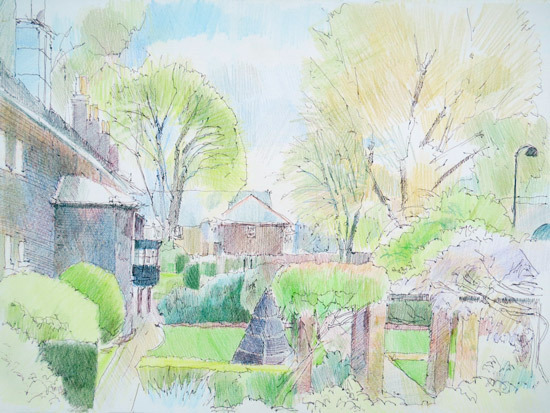 After a very satisfactory lunch, I then visited the exhibition and then sketched in the garden in afternoon - with a few false starts due to the rain. 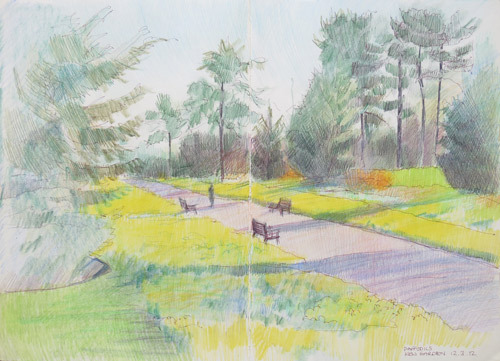 Both the sketches of gardens at the rear of the Geffreye Museum in this post are straight off the page - and, although drawn, they are not quite finished in terms of the colouration of the trees and vegetation which still needs to be completed. Basically the edges are a lacking a bit of colour. pen and sepia ink and coloured pencils on Arches HP, 9" x 12"
Click the next link (at the end of the quote) to see the list of plants in the garden. This garden depicts a scheme featuring mixed borders full of herbaceous and traditional cottage garden plants, showing the influence of both Gertrude Jekyll and the garden designers and architects working with Arts and Crafts motifs. A pergola covered with wisteria and roses marks the entrance to this space. That funny dark pyramid structure in the middle is a Pelargonium Pyramid which is completely bare at the moment. I spotted all the pelargoniums in the Victorian Greenhouse ready to plant into the structure. The Herb Garden is a walled Garden with a beds devoted to different aspects of a Herb Garden. Hoxton used to be an area of market gardens and nurseries at the time the almshouses were built. 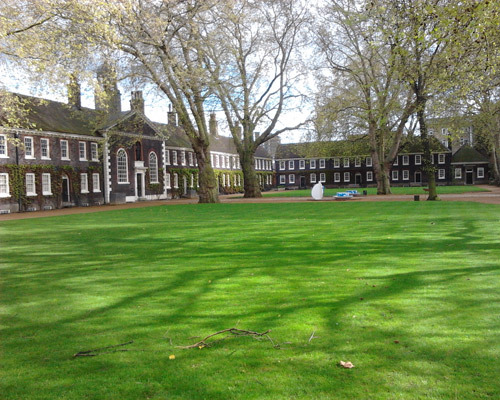 The Geffreye Museum is located in almshouses which were in built in 1714 by The Worshipful Company of Ironmongers with a bequest from Sir Robert Geffrye, twice Master of the Company and former Lord Mayor of London. The almshouses provided a home for c.50 pensioners for almost two hundred years. Over time Hoxton became one of the most overcrowded and deprived areas of London and the Company decided to move the almshouses to better location. The premises and the open space were initially sold to the Peabody Trust and afterwards to the London County Council - with a view to both preserving the buildings but also access to one of the few open areas of green space in the area. The almshouses became a furniture museum - the local area being a centre for furniture-making. The buildings are now Grade 1 Listed and the furniture museum has become a museum of the domestic home and garden. Although I've visited the Geffreye Museum before it's always been by car at times when the Hackney parking wardens aren't stalking the streets! I'd not realised before how easy and quick it now is to reach the Museum via public transport from where I live. The opening of the new Hoxton Station and the connection of the East London Line to the rest of the London Overground network now makes it much easier to visit from places across London. This is a map (pdf file) of the London Overground Network and all the stations across London which can now be used to reach Hoxton. I shall certainly now visit more often - because of the plants in the gardens at the rear and the scope for peaceful sketching of gardens! You can compare this video of a sketch done using a stylus and the Brushes app on my iPad with my last post about my pen and ink and coloured pencil sketch of The magnolia in April. This time I developed the sketches alongside one another (they were developed over a couple of mornings because of the way light moves in the early morning). This time I was making a conscious effort to use the stylus more like I use a pen or pencil rather than pastels. At the moment I think I prefer the pastels mode - but suspect this is probably more about me needing to get to grips with the different brushes and ways in which these can be adjusted! You'll be able to tell from the video below that I do tend to take the "wprk all over" approach to a bit of an extreme! Post embed code to this blog post! If anybody has an improved way of getting videos of iPad sketches on to a blog post I'd love for you to share! Something else I learned from the manual. Worth keeping in mind for the future! If your painting has many strokes, exporting a movie may take some time, and the resulting file may be quite large (depending on the settings). When I visit my mother in Cheshire I draw the garden. 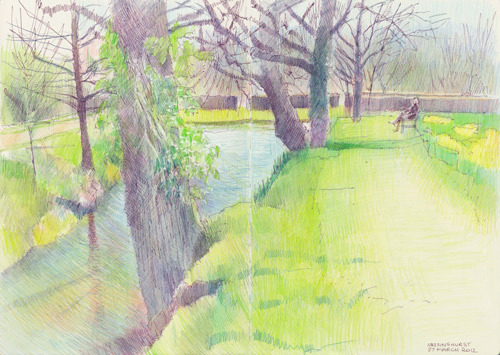 This time, to avoid the fold down the middle of a double page spread of my large Moleskine, I sketched on a block of Arches HP which I've used a lot in the past for both plein air sketches and developing work after sketching. I didn't quite finish all of the tree branches on the left lots of finer ones need to be added in. There's another sketch as well - but that one is a step by step video on the iPad and I've not got it off as yet. 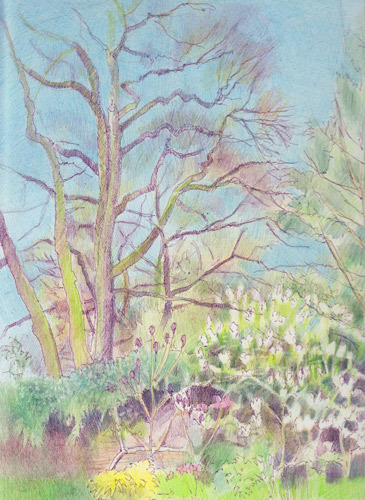 I sketched these trees in the garden at RHS Wisley on 29th March 2012 - while sat in a sleeveless shirt with sunglasses on because the sun was so strong! The thing is I can't work out what the trees are and so I've currently got my nose in my tree books. Has anybody noticed how they're very keen that you identify tree by their leaves and fruit? Has anybody noticed how deciduous trees don't have any leaves at all for a large part of the year. Anybody recognise what they are from their shape. I don't know why but "lime" keeps coming into my mind. 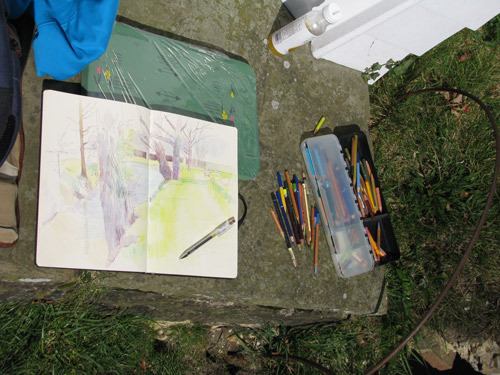 The Draw London Group visited the environment around Tate Britain recently. I was suffering from sun dazzle and no visor - after lots of sketching on very sunny days - and decided to opt for the Picasso and Modern British Art exhibition at Tate Britain. 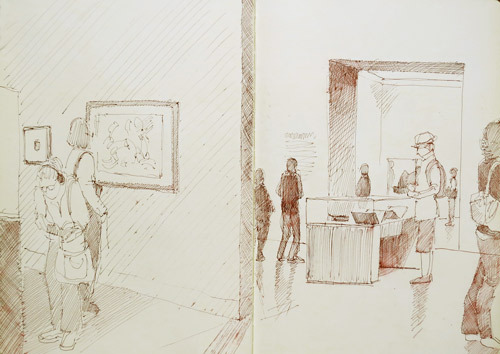 These are sketches of people viewing the exhibition. As always they are composites of people coming and going in the exhibition and I assemble the drawing one person at a time. I've just noticed that the perspective lines are not all in alignment in the sketch above. But that's what happen's when you're focused on the people rather than the perspective! The one below involved sitting the other side of a door with glass panels and looking through at the people in the next gallery. It's an excellent way to sketch without being "in your face". 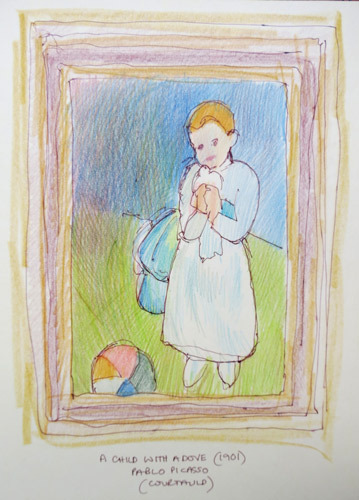 Plus a sketch of one of Picasso's paintings which I've always liked a lot. As always I learned a tremendous amount just trying to get a sense of the forum and the colour using pen and sepia ink and coloured pencils. The painting is one of Picasso's earliest works. It was painted when he was just 19 and sold to Mrs. R. A. Workman, 1924. Samuel Courtauld purchased it from her in 1928 and then it was bequeathed by him to Christabel McLaren, Lady Aberconway on his death in 1947. It remains in the Aberconwy family and has been loaned out to different galleries in London. When it's not in the current exhibition it can normally be seen at the The Courtauld Gallery. However I gather there is an inheritance tax bill and the Arts Council has been notified of an Intention to Sell this work which it's thought might be valued at around £50 million. It's unlikely that any UK gallery can afford this sum and it was announced last month that the painting may leave the UK. So if you want to see it before it disappears make a point of visiting the Picasso exhibition soon! 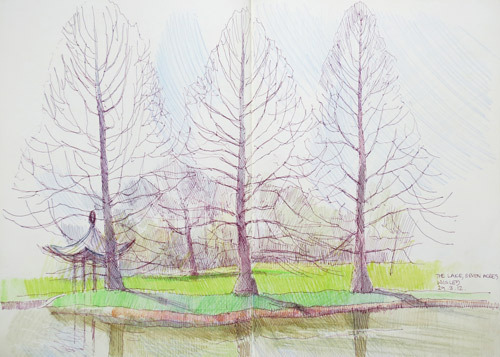 I started to post sketches from last week and realised I'd forgotten to post this sketch from one of our trips to Kew Gardens in the middle of March. I guess the daffodils will be coming to an end now - but the Broad Walk at Kew Gardens is an amazing sight when they are all in full bloom. They seem to have batches staged so they start at different times. Also the title is slightly facetious. Has anybody ever noticed the variation in the colour of daffodils and how so very often. although we might think of them all as buttery yellow, some of them actually seem to be leaning towards a lime green tinge to the yellow while others are heading towards white in colour. This is the view from the Broad Walk from the lake end. You can just see the Orangery - the white building - at the other end where I was sitting to sketch. The Broad Walk was laid out by Decimus Burton in 1845-1846 as part of his entrance design for the new Royal Botanic Gardens. The Broad Walk at Kew Gardens runs from the lake next to the Palm House to the Eastern end of the Orangery and the lawn outside Kew Palace. It's a major axis within the overall design of the layout of Kew Gardens. 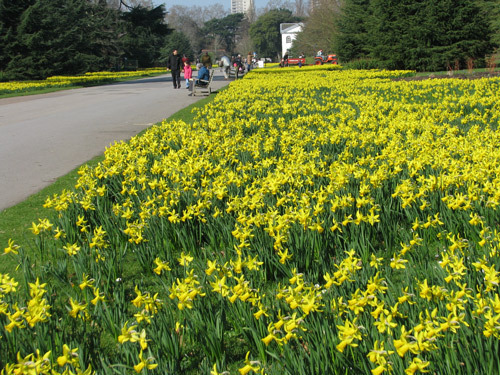 In the autumn of 2000, 70,000 daffodil bulbs were planted on either side of the Broad Walk. I love that short period in Spring when the greens are vivid. This last week we've been enjoying the third hottest March since records began and I've been in sunglasses all week enjoying the warmth, the intense blue skies, the vivid colours and the fresh new shoots of Spring - and lots of daffodils in two gardens in Kent and Surrey. 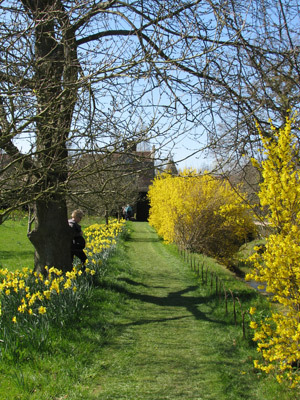 We went to Sissinghurst Castle Gardens on Tuesday last week and RHS Wisley on Friday (post to follow re Wisley). We went for a walk round the estate in the afternoon - it was lovely to be tramping over fields and along bridleways in sunshine but the extent of the drought in this corner of England is quite shocking. 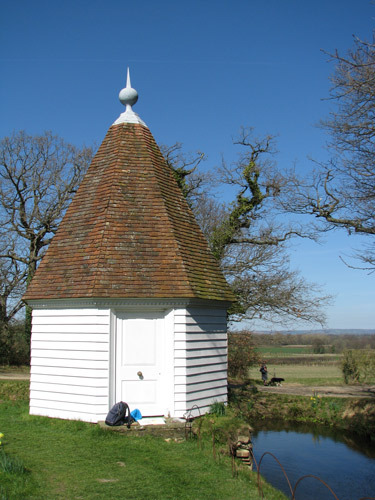 I also have a website which provides more information about the garden - check out Sissinghurst Castle Garden - a great garden. It's a wonderful garden to visit between April and the end of September. An aside: I learned while writing this post that, there's an arty connection to the Nicholasons - Benedict Nicholson, the elder son of Harold Nicholason and Vita sackville-West was appointed Deputy Surveyor of the King's Pictures under Kenneth Clark in 1939.